Fresh ginger, common in Asian cooking, is a popular flavoring agent, particularly prized for purported antioxidant, gastrointestinal and anti-inflammatory health benefits. Although it can be purchased dried, candied, crystallized and pickled, fresh ginger root is the best option for its more potent flavor and its superior nutrient content, notes the George Mateljan Foundation on its website World's Healthiest Foods. When selecting fresh ginger, make sure it's smooth, firm, fragrant, hefty and mold-free. Because fresh ginger has such a strong favor, little is used at a time in cooking. This necessitates proper storage techniques to save the leftovers. Wrap leftover unpeeled fresh ginger tightly in paper towels. Place the wrapped root in a sealable plastic storage bag and seal it completely. 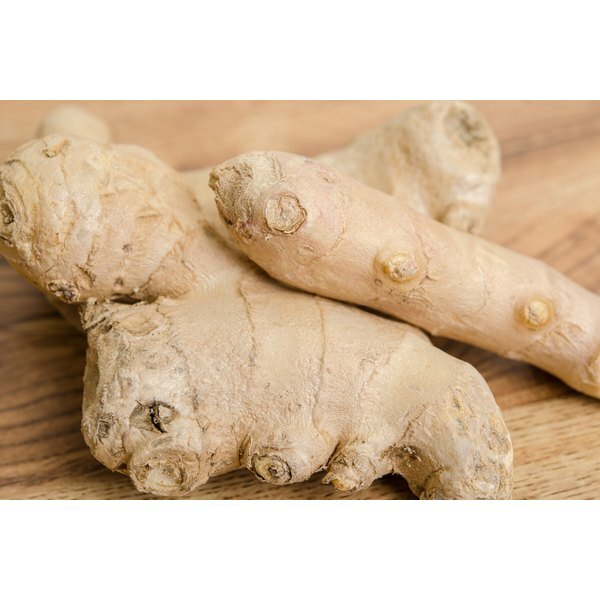 Put the bagged ginger root into a vegetable crisper compartment in your refrigerator, recommends O Chef website. Fresh ginger will keep in this manner for up to three weeks. Cut unpeeled fresh ginger root into smaller pieces, approximating the size of what you'll use at one time. Wrap them individually in paper towels and put the pieces into a sealable plastic freezer storage bag. Seal the bag securely and put the ginger into your freezer. When frozen, fresh ginger can be stored for up to six months, according to the George Mateljan Foundation. Place leftover peeled ginger into an airtight glass jar. Pour enough Madeira or Sherry wine into the jar to fully submerge the root. Close the jar completely and put it in your refrigerator. Fresh peeled ginger can be kept for up to three months this way, states Gourmet Sleuth website. If you also purchase dried ginger, store it in an airtight glass jar in a dry, dark, cool place. It can also be refrigerated the same way. Food storage is not a precise science, and how long your fresh ginger lasts is partly affected by its freshness at the time of purchase. Even properly stored, ginger root can get moldy in the refrigerator or turn bad before the stated times. Inspect your saved ginger before reusing it. Peeled ginger root will absorb some of the flavor of Madeira or Sherry wine when stored in it. Expect hints of this flavor to carry over to the food you prepare using the ginger.